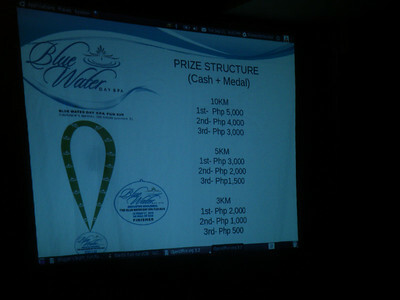 Blue Water Day Spa, in its commitment to beauty and wellness is holding its first ever Blue Water Day Spa Fun Run on October 17, 2010 at the Seaside, Mall of Asia. 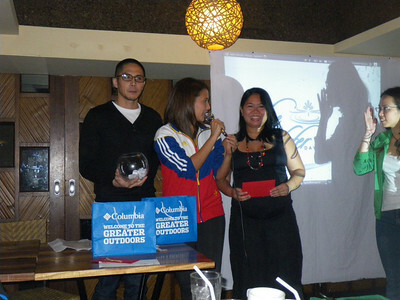 As part of their information campaign, Blue Water Day Spa invited bloggers last September 21, 2010 at Kabisera ng Dencio's at the Fort where they talked about the run and encouraged the bloggers to help create buzz for the event. They discussed what runners can expect as well as the logistics of the event. Made me wish I wasn't preggy and have to miss it, really. We were encouraged to ask questions about the event, were treated to free dinner and singlets and some of us even got to take home raffle prizes from sponsors. I particularly thank Monterey for the gift certificates I won. Of course, we were also all enamored by Karylle and Boom, celebrity endorsers of the spa who are also joining the run on the 17th. The BlueWater Day Spa Fun Run Blogger Event at Kabisera was sure fun, with a third of the attendees blogging runners/triathletes! 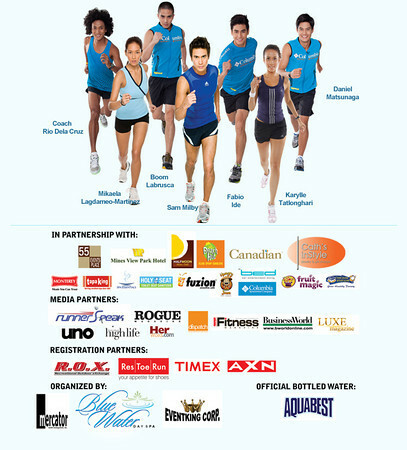 The BlueWater Day Spa 'Innovating Wholeness' Fun Run will be held at the grounds of SM Mall of Asia. Starting 4:30 AM, runners will be treated to a guided warm up. The race will officially start for the 10KM runners at 5:00 AM. 5KM and 3KM runners will follow. This will entitle registrant to a race kit each which will include a Singlet, Towel, Race Bibs, Race Map, and Drawstring bags with lots of freebies (we're talking of the latest BlueWater Day Spa brochure, BWDS pin, vouchers, freebies courtesy of Alaska, Aquabest, Beach Hut, Eagle’s Wing, Luxe Magazine, Nature Valley, Spa Essentials, and Total Fitness Magazine). The loot bags, however, can only be claimed after one has finished the race. First of all, this is a fun run so it's less competitive and more about having a good time while embracing healthier habits. It's perfect for active families and friends. Then, there are the celebrity runners like Coach Rio dela Cruz, Mikaela Lagdameo-Martinez, Boom Labrusca (who will be part of Usapang Lalake in Studio 23), Sam Milby (who's running his first race, join him at the 3KM dash), Fabio Ide, Karylle Tatlonghari (who may be doing the 5KM one) and Daniel Matsunaga. There will also be the special participation of the likes of Senator Pia Cayetano, Kiko Rustia and Coach Alfrancis Chua. And dare I mention that there will be 40 Brazilian models (not sure if they're all male or a mix of genders) running the 5KM race as well? Other stars are also expected to join as there will be a stage set up and food will be provided to the runners after. Exhibitors like BED (Bar, Entertainment, Dining), Fuzion Smoothie Cafe, Citibank, Fruit Magic, Paul Calvin's, Tapa King, Eagle's Wings Enterprise, The Tides Hotel Boracay and Natue Valley among others are also sure to offer special treats to guests and participants. In fact, there will be an area that would seem like a bazaar for the exhibitors and other sponsors that would have stations there. And yes, participants will be enjoying more treats on the day of the event! Sponsors include Cath's In Style Fine Jewelry, Canadian Manufacturing, Columbia Sportswear, Beach Hut, Holy Seat, Half Moon Asian Cafe, Monterey, Hungry Juan, Magnolia Chicken Station, Mines View Park Hotel, 55 Eevnts Place and Spa Essentials. Their official bottled water for the event is Aquabest and event partner are Event King Corporation and Mercator Model Management Incorporated. Venue partner, of course, is SM Mall of Asia while media partners include Business World, Business World High Life, Dispatch, Herword.com, Luxe Magazine, Rogue Magazine, RunnerSpeak, Cablelink, Total Fitness Magazine, and Uno Magazine. Registration partners are ResToeRun, Timex and R.O.X. Yep, there's more. Participants are encouraged to join the "Jazz Up Your Singlet" contest as part of the BlueWater Day Spa Fun Run. Runners can unleash their creativity by designing their singlets using any material possible (feathers, sequins, paint, etc). The only limitation is that the logo in front and the caption at the back of the singlet should remain untouched, and that the runner should really wear the singlet from start to finish of the race they're participating in. Additional points will be given to those who will use logos of the sponsors as part of their design. Consolation prizes will be given to 100 finalists and contest winners will get free special gift certificates from Blue Water Day Spa. All finalists will also get a chance to strut their designs onstage. So as you can see, this particular run may not be free but it does offer so much more in return. Just make sure to get to the place early and park within where SM has jurisdiction to avoid bad elements from messing with your property. Plus, don't bring unnecessary valuables anymore if you're leaving those in the car. Carbo load the night before and maybe just eat a banana and hydrate before you head onto the race. You can have a proper breakfast later. Portable toilets will be provided in one area of the grounds, but for preggos like me, it still might not be enough to come. They expect around 5,000 people to turn up so it will still be a major crowd to have to deal with for someone like me who will be 8.5 months pregnant by October 17. Still, the Blue Water Day Spa Fun Run is sure to be a great event for families and friends, even colleagues, to participate in. It's also sure to be a great opportunity for photographers. 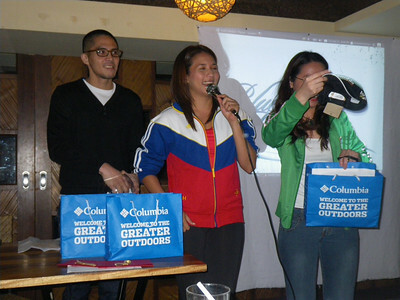 Karylle is looking to place so 5KM runners be warned for she really isn't just a pretty face.